3 How Does Radiant Floor Heating Work? 4 What Makes Radiant Floor Heating So Comfortable? 5 Is a Radiant Floor Heating System Noisy? 5.1 Do you have to break up an existing concrete slab to install radiant floor heating? 6 How Much do Heated Floors Cost Per Square Foot? If you’re wondering where in your smaller home you could fit a heating appliance without wasting space, or if you’re simply want to enjoy comfort and warm flooring, you should consider installing a radiant floor heater. There are two main types of radiant floor heating, which include hydronic and electric so that you can choose the best heating type for your needs. This buying guide will give you some ideas about how radiant flooring works and what you can expect from this kind of flooring. The radiant floor heater reviews are sure to give you some great suggestions to help you to choose the best radiant floor heater for your needs. The great news about this kind of heating is that it is not very expensive to install and it will last you for many years. If you’re ready to give your home some great comfort and a modern touch, read on to find out just how you could benefit from choosing radiant floor heating. Included with this radiant floor heating system is everything that you could possibly need to install a 70 square foot electric heating system in your floor. The warm wire spool is enough heat wire to create a layout of 70 square feet. The kit also comes with coil straps. Absolutely everything is included with this heating system to allow you to install it for yourself if you are confident enough. You won’t need to worry about needing to purchase any additional parts for the heater. The SunTouch WarmWire 3.0 kit also comes with a touchscreen thermostat that features a thermostatic wire. This can detect the temperature of the floor in order to regulate the heat. 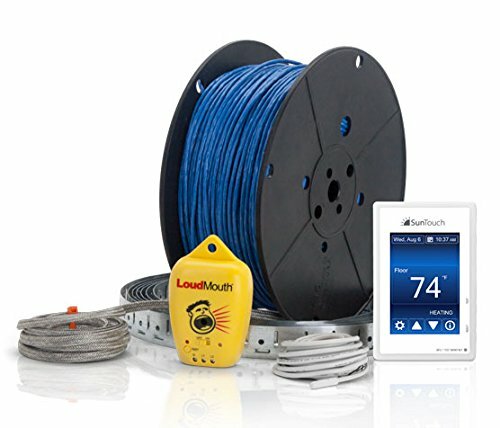 This system requires the wires to be 3 inches apart, which allows you to create fewer turns in your wiring layout. This makes laying the system far easier in comparison to models that require a 2.5-inch gap. To give you complete peace of mind when you purchase this heating system, it comes with a 25-year manufacturer’s warranty. As this is such a high-quality radiant floor heating system, it is unlikely that you will need to use this warranty. This is the ideal heating system if you want to keep your bathroom, kitchen or entryways heated comfortably. At just 1/8” thick, this radiant floor heat mat is a great way of adding warmth to your floor without adding too much height to it. Although this radiant floor heat mat does not come with a thermostat or heat controller, you will be able to purchase one separately if you wish. You can even purchase a variety of Nuheat programmable and non-programmable heat controllers so that you can be certain that it will be compatible with the heat mat. This is an energy efficient heater and so you can expect your electricity bills to stay low even if you use this system frequently. This is a standard mat that measures 60” x 36” in size. It also requires a 120-volt supply. If this radiant floor heating mat isn’t the right size for your floor, however, you can either use more of the same sized mats or check out similar mats in Nuheat’s range as there are many different sizes available for you to choose from. This heating system will not produce any noise so you won’t need to worry about it being an annoyance when you have it installed and it is also clean in its operation. This is a 20 square foot radiant heating mat that is sure to provide you with great value for money and a low-cost heating solution for any room in your home. If you need more than 20 square meters, all you need to do is purchase more than one mat and lay them close together. 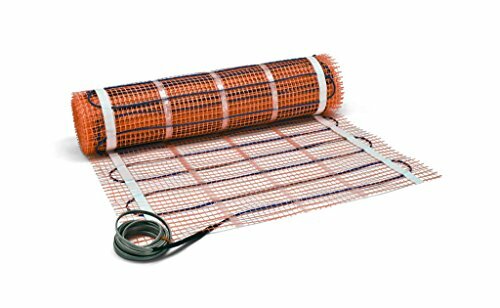 In order to make this heater mat fit into your room, you are able to cut the mesh that spreads the heat out, but you should make sure that you don’t cut through the wire as this will damage the circuit in the system. The cable that runs through this heater mat is thick and high quality to provide ultimate safety and durability. The cold lead is thin in comparison to the heater cable. It doesn’t matter if you don’t already have a thermostat in your home, as this radiant floor heating mat comes with its own integrated floor sensing thermostat. 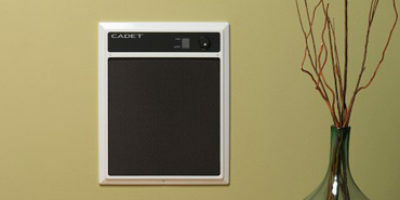 The thermostat will monitor the temperature of the floor to ensure that it is safe for you to walk on. To offer you complete peace of mind with this heating system, the manufacturer offers a warranty that lasts as long as the “life of the floor”. If you want a convenient way of laying your radiant floor heating, this under tile heating mat is a convenient choice. With a large surface area of 40 square feet, it is a suitable space heater even for larger rooms in your home. In addition, it comes with adhesive backing. This adhesive backing allows you to lay the heating easily and quickly and the best thing is that you’ll not need to use a stapler or any other means of keeping the mat in place. To ensure the best possible adhesion to your flooring, you should always stick this mat to a smooth and clean concrete flooring. Any other flooring is not likely to produce a strong bond between the floor and the heat mat. You can combine this 140-volt heating mat with more if you like, as the thermostat that is included is capable of working with a 150 square foot area. The thermostat that comes with this radiant floor heating mat will keep your room at a moderate temperature at all times if you wish. It takes around 2 hours for the floor to heat up to the optimum temperature, however, so it may be a good idea to use a timer with this product. 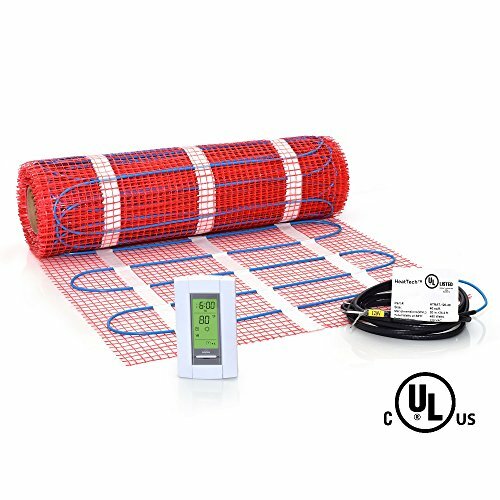 This radiant floor heating set comes with enough heating wire to allow you to create up to 50 square feet of under-tile radiant heat. Running at 120 volts, this heating system is enough to heat a moderately sized room in your home. The heating cable is made from twisted pair wiring to ensure that it provides zero EMF and it also has a single cold lean. The laid system is very thin and will not significantly raise the level of your floor. You should lay the wiring no less than 3 inches apart in all places for safety and this will give you an even coverage of heat throughout your floor. The heating system comes with aluminum tape so that you can secure it to the floor. It also comes with a high-quality Honeywell digital floor thermostatic sensor wire. This will help the system to maintain the temperature in your room and it will also prevent your floor from becoming uncomfortably hot. As this system gives you complete freedom with where you place your radiant floor heating, you should take special care to ensure that you lay out the wiring in the best way to benefit your home. This SunTouch radiant floor heating mat is just what you need when you need a heating system that is easy to install and low cost. It is 2 x 7.5 feet in size and equates to heating a 15 square foot area. You will be able to use more than one of these heating mats if you need to so that you can heat up the entire floor. When you get this heating mat, you’ll also receive a detailed instruction manual to help you install it for yourself. You will also be able to access plenty of installation videos online too so that you can install it for yourself if you wish. If you are able to install this heating system for yourself, you will be able to save money. The manufacturer offers a 25-year warranty on this heat mat. This allows you to contact the manufacturer if there is a problem with the system and they will be able to replace it for you. The main thing that this radiant floor heat mat is missing is a thermostat. Radiant floor heating systems with a thermostatic wire are able to regulate the temperature of the surface of the floor. This is something that you may want purchase additionally to install when you are installing the system. If you are considering purchasing a radiant floor heating system, you will be pleased to know that you’ll be making a great investment. As well as being able to enjoy comfortable and energy efficient heating, having radiant floor heating installed in your home may even increase the sale value of the property. There are 2 main types of radiant heating systems for you to choose from. These are electric systems and hydronic systems. You will need to think about which will be the most suitable type for your home. – If you already have a hydronic heating system in your home, or if you are going to be installing a new hydronic system in your home, it certainly makes sense to choose this kind of radiant floor heating system. You will be able to connect it to your existing heating system with ease and control the temperature using a thermostatic valve and your home’s existing thermostat. These heating systems are cheap to run and cheap to install but you will need a boiler to heat up the water in the system. If you don’t currently use a hydronic heating system, this may not be the right choice for you. – On the other hand, you could choose an electric radiant floor system. Wires are laid out in a serpentine shape within a mat, and you can use multiple electric heating mats to cover the entire floor. This kind of heating system can be plugged into a socket or it can be wired into your household’s electricity supply. One of the main setbacks about this kind of heating system is that it is usually very expensive to install. In addition, if there are any problems with the heating mats, you will need to take the entire floor up to fix this. As hydronic systems are quite maintenance-free, as long as there are no leaks when the heating is installed, they can provide years of very reliable use. When you install your radiant heating system, you will need to consider the size of your room. These systems cover the entire area of the floor so that they can heat the room effectively, so you should remember that the size of the heater that you’ll need would be the size of the flooring. This can get quite expensive, particularly if you choose an electric based system. For an irregularly shaped room, you should think about getting an electric heating kit. This will allow you to choose the best layout for your heating. If you are going to install the system for yourself, you should check the manufacturer’s instructions to find out how far apart you need to set the wires. Radiant floor heaters can be as large or as small as you wish. You will simply need to lay pipes in the flooring where they are needed. So that you can control the heat in your home better, you should employ zone heating. This will mean that the radiant floor heating is split into sections. Whilst some people may choose to control an entire floor of heating with just one thermostat and timer, other people may want to use a thermostat for each room in the home, which is more energy efficient and gives you more control. When you buy your radiant floor heating kit, you should check to see whether it comes with a heat controller. 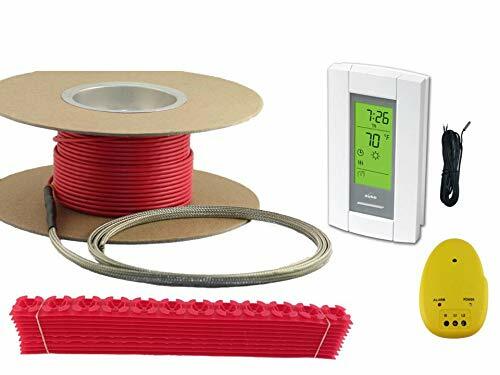 Many electric radiant floor heating systems come with a thermostat with a wire so that the mat can be automatically turned off if the floor or the surrounding area becomes too hot. Some of these thermostats even have a touchscreen so that you can choose the desired setting with complete precision. Radiant floor heating systems have a major setback in that they can take up to 2 hours to fully warm up. Although the gentle heat is pleasant, when you get up for work or school, it would be better if the floor were instantly warm. To allow your system the chance to heat up ready for when you want to use it, you should think about purchasing a timer for your heater at the same time that you purchase your space heater. This will allow you to set your heater to switch on and off automatically so that you don’t have to do it manually. Alternatively, you could even choose a programmable thermostat. This would allow you to set different temperatures throughout the day or week and different times too so that you can have the ultimate control. When you are looking for the best radiant floor heating system for your needs, you should also consider the type of flooring that you will be using over the top of it. This will help you to get the most out of your heating system. By far, the most common type of flooring that is used with radiant floor heating is ceramic tiling. Without heating, these tiles are especially cold, but when you use the heating system, you will notice that it becomes very warm and inviting to walk on. This is because tile is a good thermal conductor. In addition, it also holds heat well. You could also use wood, carpet or vinyl flooring over the heating system if you wish. You will need to remember however that the thicker that the flooring is, the less effective the heating will be. If you are adding wood laminate over the radiant floor heating, for example, you will need to use a lining below the wood to cushion it and this can cause the floor to become insulted against the heating. If you are going to place any other flooring over the heating system apart from tiles, you should remember to keep the thickness to a minimum. If you must use carpet, use a thin carpet that has more padding underneath so that the heat can still get through. When using wood, you should consider the way in which wood shrinks and expands when you apply heat. Heated wood can shrink and even split when it is used with these kinds of heating systems, so you should try to use solid wood where possible. When you are planning your radiant floor heating system, you should factor in all the things that could potentially trap the heat and prevent it from benefitting the room. If you are going to use the heating in your kitchen for example, have you considered the cupboards and appliances? In your living room, have you remembered the sofa, any units, and bookcases that you may have? When you use a radiant floor heating system, you should calculate the floor space whilst leaving out any permanent obstacles that will always be in the way. You will be able to save money on the installation costs as well as the running costs of the heater. When an object is in the way of the heat rising, the heat becomes trapped and is wasted. Whilst you may move your sofa and other pieces of furniture from time to time, you should avoid installing radiant floor heating below certain fixed objects such as kitchen units and bathroom furniture. 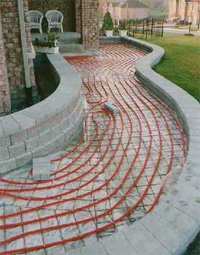 Heating a home using a radiant floor system is a cost-effective and unusual way of heating a home. The heating system is placed under the flooring and then the floor is finished, as usual, using tiles, vinyl, laminate or carpet. The heat is produced using a sequence of hydronic tubes or even electric wiring beneath or over the floor. It is possible to install this kind of heating system on a solid floor and to then set it in cement or otherwise, it could be installed over a hollow floor. The hollow floor method can be a little more difficult to set up as it is important to insulate the heating system from the bottom so that the heat cannot escape in a downwards direction. If you already have a hydronic heating system in your home, the new radiant floor heating system could be connected up to the existing system. This would allow you to use the same thermostatic controls to operate the radiant floor heating as you already use for the rest of your home. If you are installing the radiant floor system in a new home where the flooring already needs finishing, it will be more cost effective to have the heating in installed before the floor is finished. If you want to add radiant floor heating to a home that is already decorated, then this is likely to cost more, as you will need to have the floor refinished. Once the heating is installed, you will be able to safely walk over it and it will produce heat throughout the area of the floor. The heat will then radiate upwards so that you can enjoy the warmth throughout each room. There are several reasons why homeowners choose these kinds of radiant heating systems. Especially for the fact that they are efficient, comfortable and safer than many other heating methods. Anyone with a radiant floor heating system will tell you that their heating is so much more comfortable than conventional heating methods, and in many ways, they are right. But what is it that makes this kind of heating so comfortable for the user? First of all, have you ever walked on a tile or laminate floor in bare feet on a winter’s morning? If you ever have done, the chances are that you won’t do it again in a hurry. If you have radiant floor heating installed in your home, you will be able to jump out of bed, walk across the laminate floor in your hallway and straight onto your tiled bathroom floor without a moment’s hesitation. In fact, you’ll probably want to go and stand there because the warm feeling under your feet is so pleasant. Check out the top-rated bathroom heaters here! Aside from being more pleasant when you wake up in the morning, you’ll also enjoy the many options that you get when you’re considering having one of the systems installed. Most radiant floor systems are exactly the same as the next one. You won’t have to spend much time looking for the heater for you because there is no question about aesthetics. Another great thing is that you can use most types of flooring over the heating system. This allows you to have as much flexibility as you want when choosing the décor of your home. In addition, radiant floor heaters are so much more comfortable than other forms of heating because you will be able to enjoy the more comfortable air. 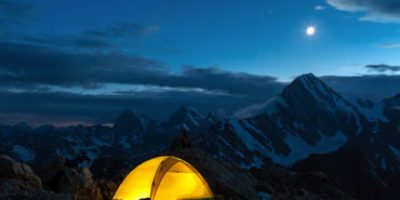 When you use most other forms of heating, you’ll find that the air becomes stuffy and dry. 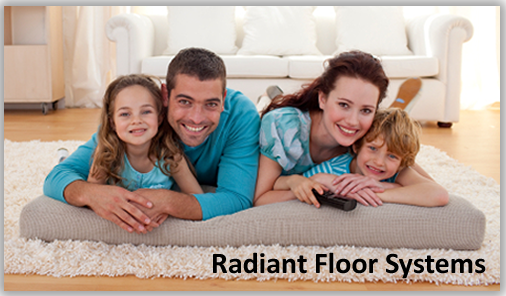 With radiant floor systems, the entire floor becomes a heater and the warm air gently rises. This results in fresher feeling air and more even heat dispersion too. A radiant floor system works by running a hydronic system of pipes under your flooring or by using electric radiant floor heating mats. Neither of these systems is noisy. Electric radiant floor heaters are just like any other electrical appliance in your home. They are either hard-wired into your floor’s electric supply, or they plug into a socket. In order to heat up the floor, a series of wires are arranged in a twisting pattern in a heating mat and then the mat is placed over the subfloor. Usually, it is common to screed or pour concrete over the mats so that the heat can be spread even more consistently across the floor. The resulting effect is completely quiet operation. Hydronic systems are similar but instead of a heat mat, a heat spreader plate is used. The only noise that you may hear from this kind of system is a hissing sound caused by air in the system or you may be able to hear the sound of the boiler heating up the water and pumping it around your home. Even if you are able to hear this sound, however, it is unlikely that it will disturb you from whatever you may be doing. 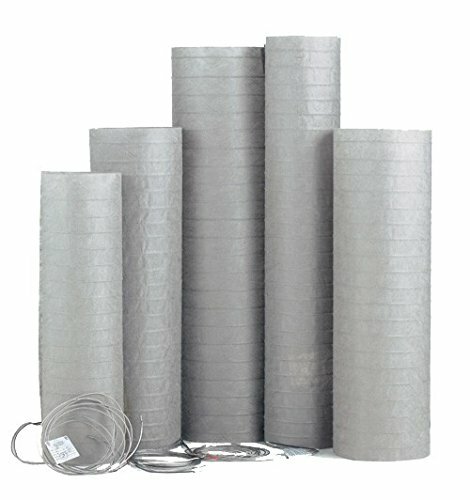 When you have a radiant floor heating system installed, there are plenty of options for installation. Whether you want to lay the heating over the top of an existing solid floor, run the heating system over joists or if you want to break into your existing floor so that you can recess the heating system into it, there are certainly more options available than simply breaking up existing concrete. If you are installing a hydronic system on your floor and you already have a concrete floor, you could either install the pipework over the existing floor or you could recess the pipework into the concrete. Laying the pipework over the top of the concrete poses some problems, especially the problem that this method will almost certainly add a substantial amount of height to your floor. Instead, a better idea would be to drill channels in your existing concrete so that you can insert the pipework into the channels. 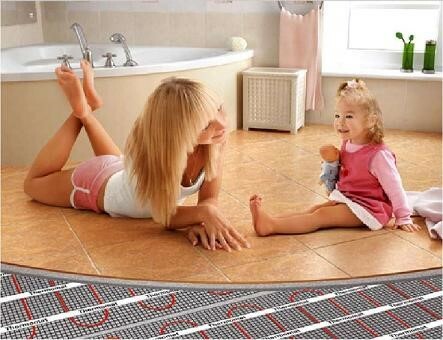 For electric heat mat style systems, it is even easier to install the radiant floor heating. All you need to do is ensure that the concrete is smooth and clean and install the mats straight over the concrete. Many makes of heat mat are designed to be as thin as possible and can be tiled over too. The concrete slab may even be helpful in making the heat mats stay where they are. If you choose mats that have adhesive backs, you will be able to stick the mats directly to the concrete so that they can’t slip. This avoids the problem of not being able to nail or staple the slabs in place. In addition, if you are installing a wiring only heating system, you will be able to use the concrete to adhere the aluminum tape to when you are securing the wiring in place. You will then be able to tile directly over the heating system. How Much do Heated Floors Cost Per Square Foot? Heating rooms using radiant floor heating is no new invention. In fact, it has been around for centuries and dates back to the ancient Turkish and Roman times where heat from the baths would circulate beneath the tiled floors and create heating. But how do today’s heating systems add up? Are they economical to run? Let’s take a look at the running costs of radiant floor heating systems. – These heating systems are the most expensive to run and as they often don’t produce enough heat to heat an entire room, they are used as supplemental heat along with another heating method. – These kinds of radiant floor heaters work a little better when it comes to generating higher heat temperatures and so you can often use these systems without any other form of heating. Installing a new radiant floor heating system can cost from $6 to $16 per square foot or around $9,000 to $22,5000 to install radiant floor heating throughout a 1,500 square foot home. This, however, is greatly dependent on the number of zones that you have in your home and how large the system will be. The price also factors in the cost of removing and replacing the current flooring. As you can see, there are plenty of great reasons why you should choose a radiant floor heating system for your home. You will be able to create comforting and enjoyable warmth throughout your home as well as being able to walk through your home with bare feet without having to deal with freezing cold tiles in the winter months. Although this kind of heating is slow to heat up, all you need to do is use a timer and you will be able to have warm floors when you want them. Coupled with thermostats, you can be sure to have consistent heating at all times. With plenty of choice and types of installation, as you can see in these electric radiant floor heater reviews, you will be able to find the perfect one for your needs. We hope that all the information in our helpful buying guide has assisted you in finding the Best Radiant Floor Heater for your home or workplace. I think that when living in somewhere with cold winters it would be very beneficial to install floor heaters. Like you said, ceramic tiles are the best option with heated flooring because of how well the heat is conducted. I think that another thing to look into is how much it would cost to run the system. If you only need your floors heated during a certain time it would be important to make sure that you can control when the floor is being heated and when it isn’t. My wife and I are working on remodeling our home, and I think that adding floor heating would be a great touch. She’s constantly wearing socks and slippers around our home in the winter to try and stay warm, so having some floor heating cables installed would be really nice! I’m glad that you talked about there being hydronic and electric floor heating options, so I think that we’re going to talk to our contractor about a suggestion and see what the best option would be for us! Thanks for the help!